Australia's first institute for research and clinical excellence in eating disorders will be launched by Federal Minister for Health Greg Hunt. Treating eating disorders is on the verge of being turned inside out, with the launch of Australia's first institute dedicated to research into the devastating and deadly mental illness. The InsideOut Institute, a collaboration between Sydney Local Health District and the University of Sydney's Charles Perkins Centre, aims to ensure every Australian living with an eating disorder has access to the best possible care by rethinking they way eating disorders are treated. To coincide with it's launch on Monday, Institute director, Dr Sarah Maguire is calling for the destigmatisation of eating disorders to help curb the associated death rate. 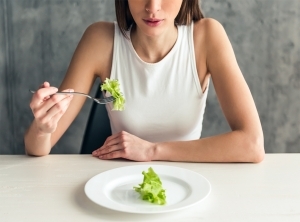 An estimated one in 20 Australians has an eating disorder - a complex neuropsychiatric illness. Suicide is said to be up to 31 times more likely for people with an eating disorder and many sufferers die because of medical complications. Dr Macguire says greater public education campaigns and innovative treatments and services are urgently needed. "Anorexia nervosa has one of the highest (if not the highest) mortality rates of the mental illnesses and imposes a carer burden higher than for depression or schizophrenia," she writes in an opinion piece for the Medical Journal of Australia. "Together, eating disorders have a total social and economic burden greater than that estimated for anxiety and depression combined." Despite this, stigma and general public perception of the illness has rendered it "neglected" on the the list of human health priorities, Dr Macguire says. "Eating disorders bear all the hallmarks of a devalued or stigmatised subgroup, among an already stigmatised group of mental illnesses, leaving them doubly disadvantaged," she wrote. But the expert has hope the newly launched institute will bring about real change in treatments. "To truly limit the impact of an eating disorder, early intervention for illness must become a national priority. More research is needed in this area, and the findings of research need structural supports to translate them into practice," Dr Macguire wrote. MensLine Australia 1300 78 99 78. Kids Helpline 1800 55 1800 (for young people aged 5 to 25).